I'm thinking of building the planes from either the Lexington or Enterprize from the Battle of Coral Sea or Midway. I am looking for these planes that you can fold the wings on so what kits can you guys recommend that meet my needs? I already have the TBD. Just a couple of days ago I was wandering around the 'net looking for recommendations for a variety of kits in 1/48 scale. I found an older post from the modeler "DOOGS ATX" who now has his own website, youtube channel, and I think used to participate here. He's all over the net and a good modeler. F4F Wildcat - Tamiya's F4F-4 is a marvel. For the earlier -3 or General Motors-produced FM-1 and FM-2, Hobby Boss. These are solid, but canopy size and fit issues can be frustrating. 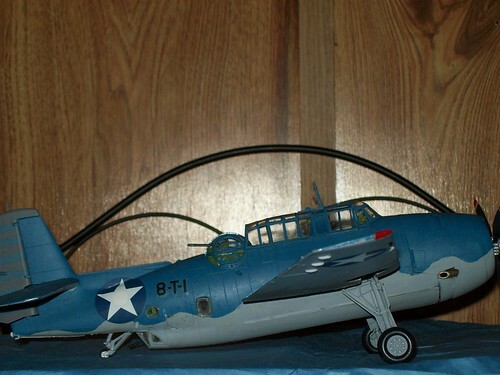 SBD Dauntless - old Accurate Miniatures kit. Keep in mind the Dauntless has been re-boxed and re-badged by Italeri, Academy, and Eduard. You should still be able to easily get the Academy "Battle of Midway" offering. For actual Accurate Miniatures boxings, you'd probably need to go the Ebay route. And if I'm not mistaken, none of those kits have a folded wings option out of the box. For folding wings Midway era builds, OOB, for the least hassle, I recommend the old classic Monogram kits for both, and I would seek to include their TBF as well if you can get them. The SBD never had folding wings, and it is a simpler build then Accurate Minitures. The TBF, on the other hand, had folding wings, and was also in the Battle of Midway. 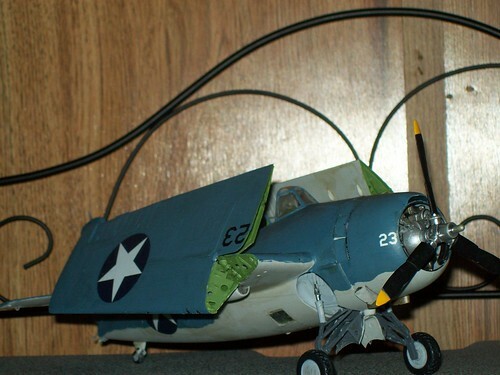 Like with their TBF kit, their F4F comes with the unique Grumman designed back-folding wings option. From my experience in building all four of them by Monogram (which includes their TBD), and after all the grief and pain in building Accurate Miniatures TBF, even though I have their SBD's, I would rather build Trumpeter's and enjoy the larger scale to go with the degree of effort again for their typical, over-designed cockpit interior fit issues. Monogram's 1/48 F4F has also been released under the Revell label, and is easier and cheaper then modifying the more expensive Tamiya kit, and has many good build reviews for it. On the other hand, Trumpeter makes all three in 1/32, and from my experience with their F4F, the wings can be assembled folded nicely. Also, one more option for the SBD is the old Hasegawa SBD-3 kit in 1/48. The Monogram kits are from the old â€œworking featuresâ€ days and are fairly simple with raised details. If that's what you are looking for, that's fine. But for more accurate kits with modern features like good detail, accuracy, and recessed panel lines, the Tamiya Wildcat and AM SBD are way to go. The Hobby Boss Avengers in 1/48 scale are really nice and downsized clones of the Trumpeter 1/32 Avenger. The kit has the folded wing option as well. I think it's the best 48 scale Avenger on the market. Accurate Miniatures for the Dauntless and Tamiya for the Wildcat. Wolfpack resin make a wing fold set for the Wildcat. I like the old "working features" kits because you can literally go from displaying a big winged bird like a TBF from a wheels-up suspended display to a nice minimal shelf-space option with gear down like I have with my HobbyCraft/Trumpeter 1/32 F4F. But after looking at my AM SBD's, I bought a couple of Trumpeter's in 1/32 because I like the size better, and with their TBF, I rate their build-ability for a subject that small as the main reason they went out of business. I literally have to keep the AM 1/48 TBF in a bigger display case then the 1/32 F4F because of its' non-folding wings, so if the Hobby Boss kit is a good one for internal parts fit, then definitely that would be good option also. The fact that you can fold the wings on the old Monogram kits doesn't mean that they are good kits, unless your only criteria for making a choice is the ability to fold wings, even if the mechanism is simplified and inaccurate. If that's someone's criteria, that's fine, but people should be realistic about the other features of these very old kits. The main reason AM went out of business had nothing to do with the kits being too small to build. I'm sure AM has sold many, many times more 1/48 SDBs and TBFs than Trumpeter has of the 1/32 versions. If people prefer 1/32 over 1/48, that's fine, but the OP was asking about 1/48 kits specifically. ...And it doesn't make them bad kits-they still sell and build up quite nicely. I based this alternative suggestion to our friend here because I assumed his would be building for some sort of commemoration of the Battle of Midway, which occurred between 4 and 7 June 1942, and I assumed that he would like to finish them before Christmas this year. If you look at a calendar, that gives him just over two weeks. Notice, he said he has a TBD, and he said"am looking for these planes that you can fold the wings" and that, of course would be the Monogram kit, so why not keep it simple and just finish the builds with Monogram/Revell kits? I have a built-up TBD that I did as a yellow-wings variant, and I have it displayed with its' wings folded, although I find the lack of mechanism detail to not be "on-par" with my 1/32 F4F, especially with it's crude and flimsy molded-in hinges. But they don't show with the wings folded. Very good, I'm glad that you realize that. My "hat is off" to you. I don't guess that you ever actually built any of their kits. "I rate their build-ability for a subject that small as the main reason they went out of business." The main problem is after building up the interior, it simply will not fit into the kit's fuselage halves as-is. It took me days of extensive dry-fitting, sanding and filing to finally get the assembly to fit in. After I built their TBF, I did some checking and found out that they literally "over-engineered" their "perfect-to-scale" cockpit interiors by failing to compensate for the thickness of the injection-molded plastic fuselage halves being much heavier then the actual airplane's aluminum skin. That is why, IMHO. they went out of business. Now if you think they are the "gold standard", I actually have both of Accurate Minitures' SBD's (complete with their factory provided AM correction stuff), their F3F, and SB2U Vindicators I can sell you, or anyone else. But now since they are so "pure and precious", they "ain't goin' cheap". The Tamiya F4F canopy (or even better, the Squadron vac canopy #9505) is a perfect fit for the Hobby Boss kit. I can't speak to AM's Avenger but I have built a couple of their SBD's. In my experience they go together quite well, if you follow the directions to the letter. You would be wrong about your unfounded assumption that I've never built any of their kits. Your sarcasm and righteous attitude shows that you are unwilling to have a reasonable discussion about things. I'm done dealing with you. Please do not post in any thread that I start as I'm not interested in your opinion. Congrats, you're the only person on my ignore list. Like I said, after their TBF, and when building the Trumpeter F4F beside it, for that amount of effort, to keep on with Trumpeter in 1/32 was a "no-brainer". Now I may have failed to mention that many people did not know that the Vaught SB2U Vindicator saw action at Midway as well. Been reading up some more on Midway and the Vindicators seem to be Marine land based birds and I'm guessing the TBF's were land based as well. Everything I have read about the battle was carrier based birds which is what I'm thinking about. The recent discovery of the Lexington showed 3 TBD's and a Wildcat (with 4 kills) on the ocean floor. My idea was to show these birds, or a representation of them, before the battle getting ready for take off. I'm sticking to 1/48 scale simply for the size and the fact that these old eyes and hands don't do well with smaller stuff anymore. Since the SBD does not have folding wings I can go with just about any kit that's affordable but the folding wings for the Wildcat and TBD are essential for space considerations as well as budget. Thank you guys for your inputs and help!! I really appreciate it very much! I had the Accurate Miniatures Avenger (white box kit), and it really looked spectacular in the box, I can say that. I regret having sold it, though I did keep the Yak-3 and both Il-2 kits (I think).